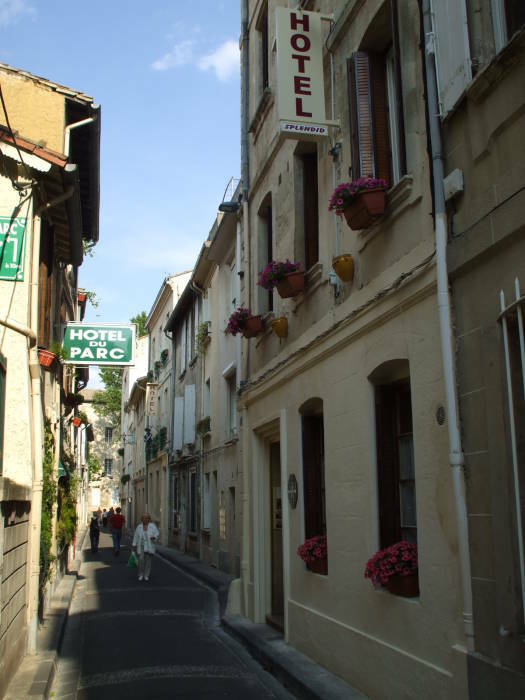 Yes, there really are nice low-cost hotels in France. Let's see what's available, from the Marais and Gare Saint-Lazare areas of Paris, north and northwest through Normandy and into Brittany, and down south in Provence, in Avignon and Marseille, and then west into the Languedoc region. These will show you France as the French people see it. Independent hotels, owned by a person or a couple or a family, and staffed by them. 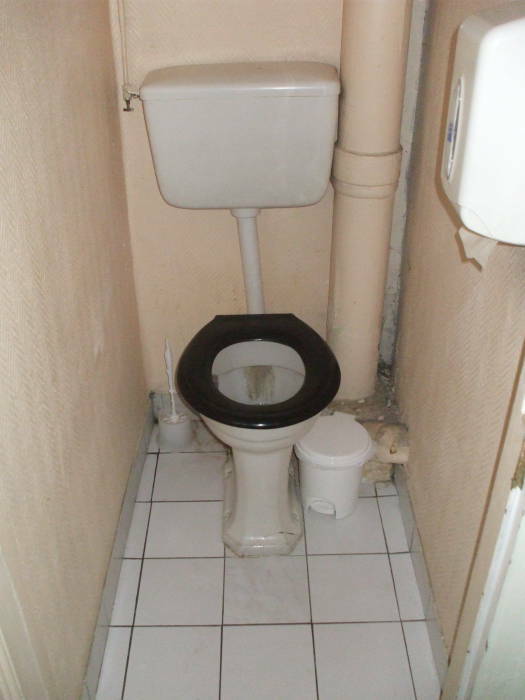 You will always have a lavabo or washbasin in the room, but it will likely be toilette au couloir. That is, the toilet will be down the hall. The shower will similarly be at least down the hall, possibly on another floor, and subject to a small nominal fee per use. En-suite rooms, those with full bathroom facilities within the room, usually mean a step up in cost and aren't necessarily available in hotels in smaller towns. Welcome to the real France, and facilities like those common in the U.S. through the mid-20th-century. In all of these, +33 is the country code for France and (0)1 is the city code for Paris. Omit the leading 0 when calling from outside France (i.e., use +33-1-xyz for a Paris number called from overseas), use it when calling from elsewhere in France (i.e., use 01-xyz when calling Paris from Marseille), and omit the city code when calling from that city (i.e., simply use xyz). American readers may need to be reminded that people in France speak, read, and write French. You can call, write, or email to reserve a room, as long as you are able to communicate with the proprietors. Both the Lonely Planet and Rough Guide series can be useful. However, realize that they list only a small selection in the largest cities, only one or two in some of the smaller cities and towns they include, and none at all in many towns you will want to visit. Also realize that Lonely Planet was aimed almost exclusively at budget travelers back around the year 2000 or so, but from then through about 2010 it changed to focus on much more upscale accommodation. Refer to editions from the late 1990s through the early 2000s. Find them in major libraries and buy them used through Amazon. The Logis de France directory, both printed and on their web site, can be very helpful. The Guide du Routard series is exactly what you're looking for as a guide to budget housing in France. Several of the places listed here had Guide du Routard placards at their doors. 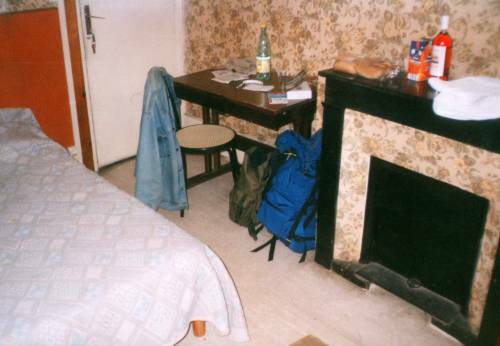 Yes, there are hostels in France, but... Outside Paris they tend to be at least on the outskirts of the city or town, and very likely well outside of it. 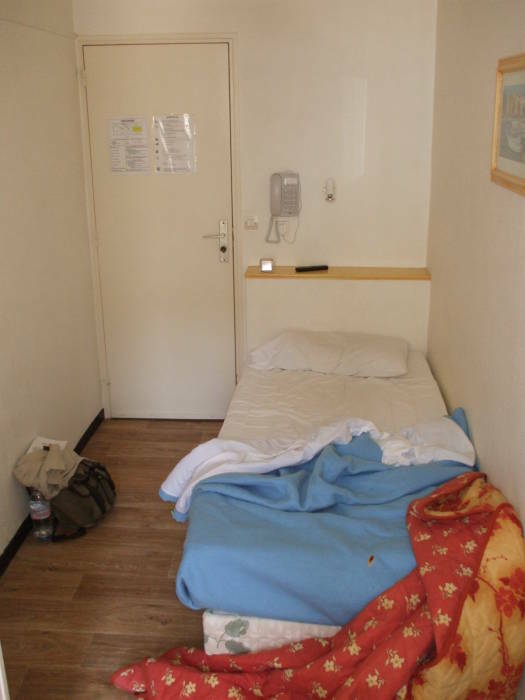 They tend to be old-school dank institutional facilities catering to large groups of European school groups, where a bed in a crowded and chaotic dorm costs almost as much as a private room in a in small hotel at the center of town. 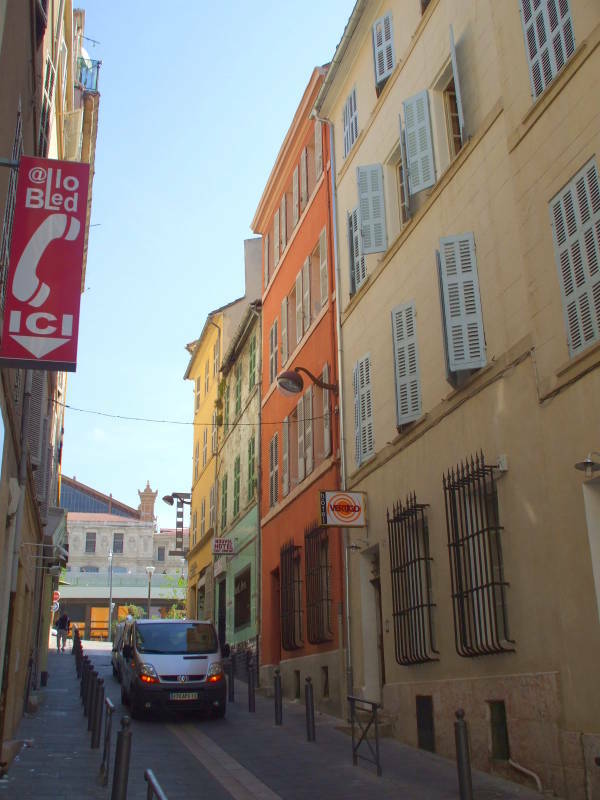 An exception to this is the excellent Vertigo Hostel in Marseille, which has a mixture of shared rooms and en-suite hotel-style rooms. Everywhere else, you will want to stay at the small local hotel. Hôtel Rivoli is at 44 rue de Rivoli. That's at rue des Mauvais Garçons, the Street of the Bad Boys, just east of l'Hôtel de Ville. They have a web site with pictures and descriptions, but they don't take reservations through the site or via e-mail. Call them on the phone, +33-(0)1-42-72-08-41, and be ready to speak nothing but French. You may need to mail them some Euros to hold your reservation. When I've been there it was 35€ for a single with no bath, 55€ for an en-suite double. 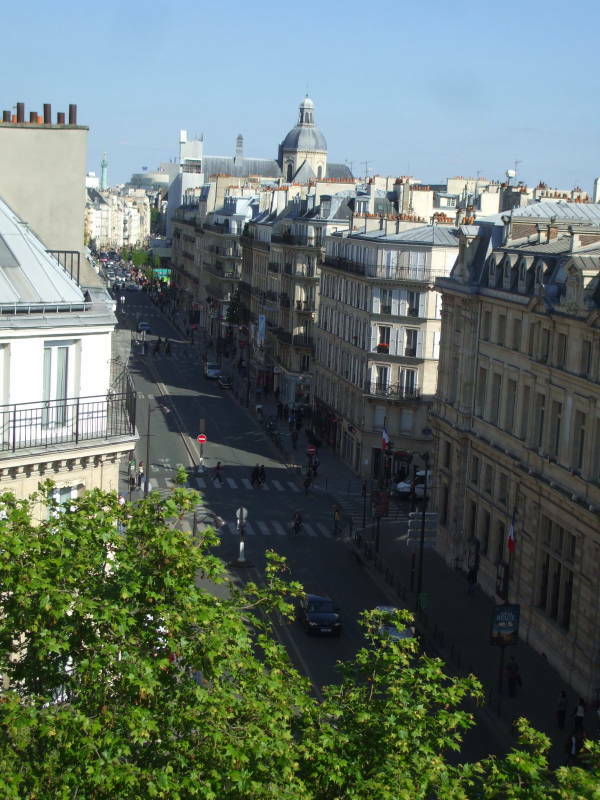 I've stayed there three times now, the second and third time in room #25, on the top floor at the end of the hall, with a view that included the towers of Nôtre Dame and looking down rue de Rivoli to the column at Place Bastille. The beacon on the Eiffel Tower is visible at night, although the tower itself is not. 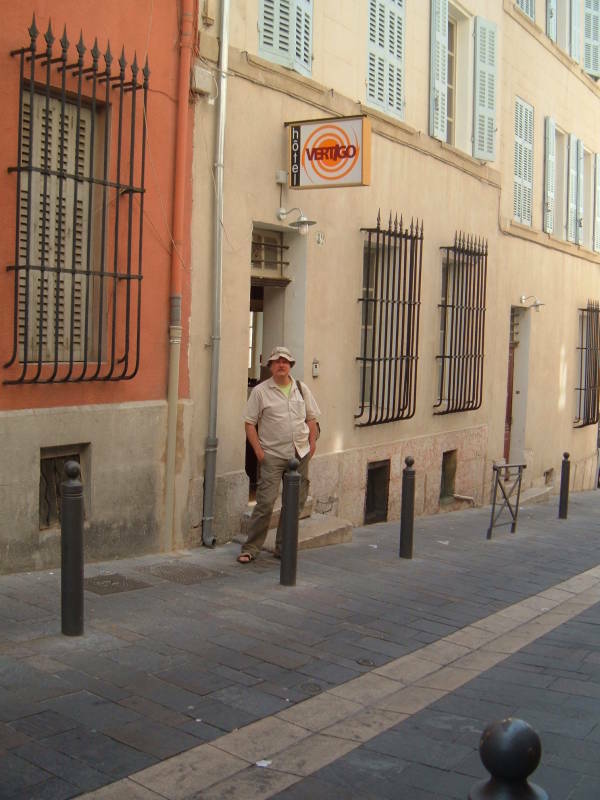 Here I am at the entrace, just around the corner onto rue des Mauvais Garçons. Once inside, you will have some stairs to climb. The office is on the first floor, up one flight from street level. That's the first of six floors of rooms. #25 is on the top level, up under the roof. It's the one with the narrow dormer looking out from the corner, just below the row of chimneys in the picture below. The brasserie down on the street level of the building is a nice place to get breakfast and dinner. Or, you can choose one of several other brasseries in the neighborhood. 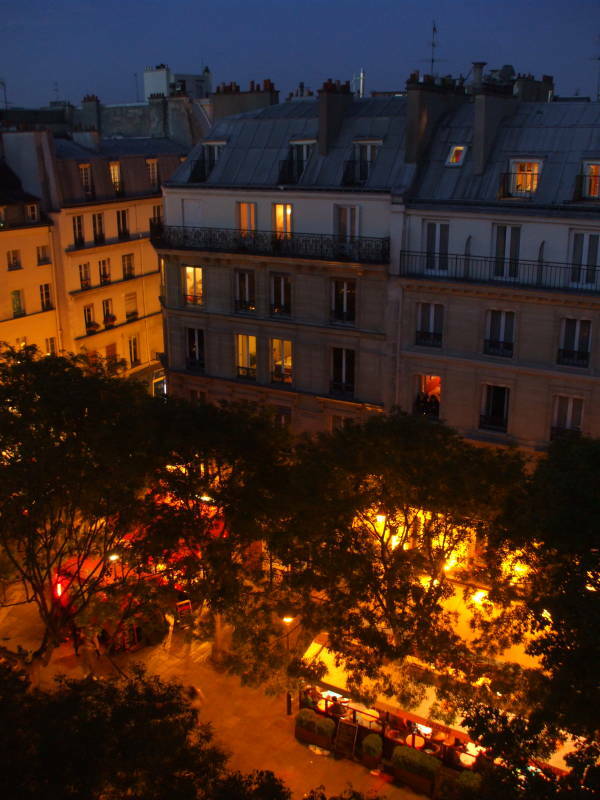 There are some small bars and restaurants along the first street north and parallel to Rue de Rivoli, and more along the street leading north into the Marais. In the last picture above I'm in my room and looking out the dormer window. 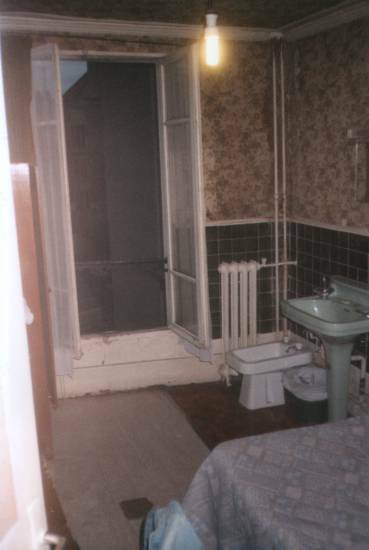 The lavabo is right in the window. The geometry in the room is a little weird, because it's right under the roof. Here's my bed, with the distinctive French style cylindrical pillow. As I said, the lavabo is right in the window. 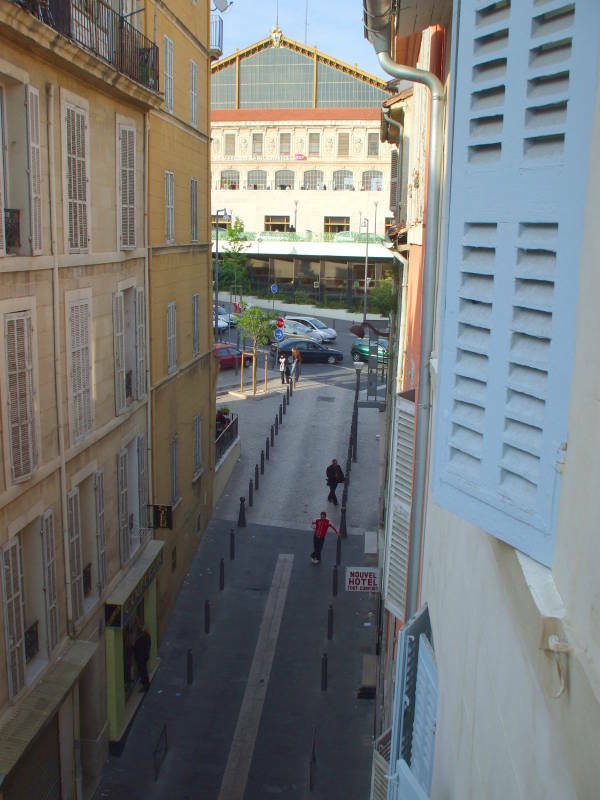 And, here's the view looking out the window, looking east on rue de Rivoli toward where it turns into rue Saint Antoine. 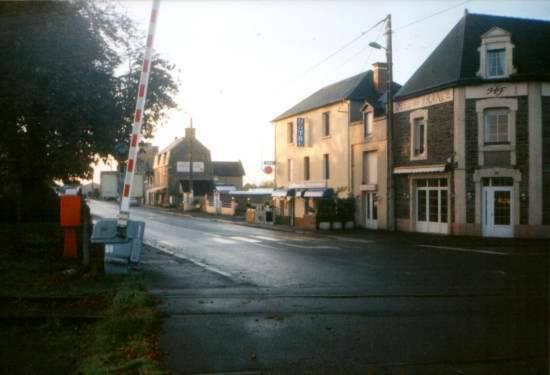 The green column in the distance in the first picture below is at Place Bastille. 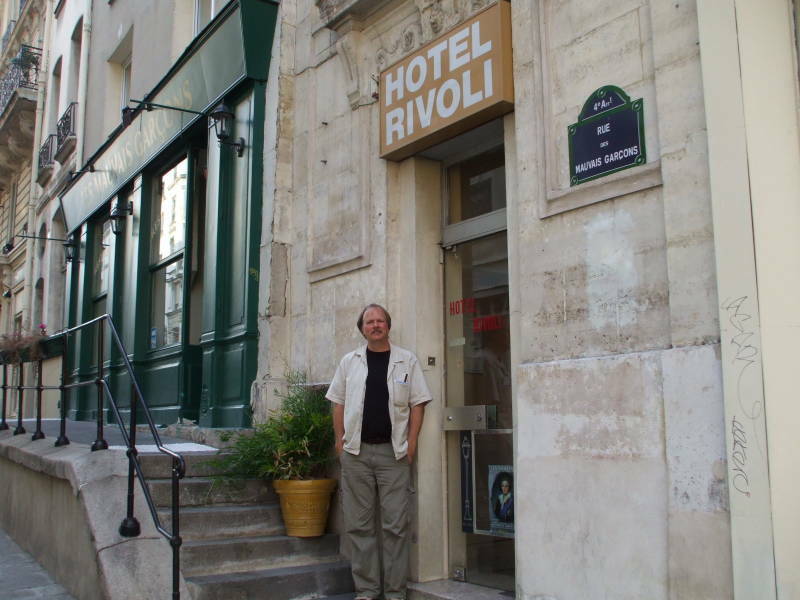 Four brasseries open out onto the small square on the east side of the Rivoli's building. They're nice places to get dinner in the evening. The streets off the back corners of the small square lead further into the Marais district. 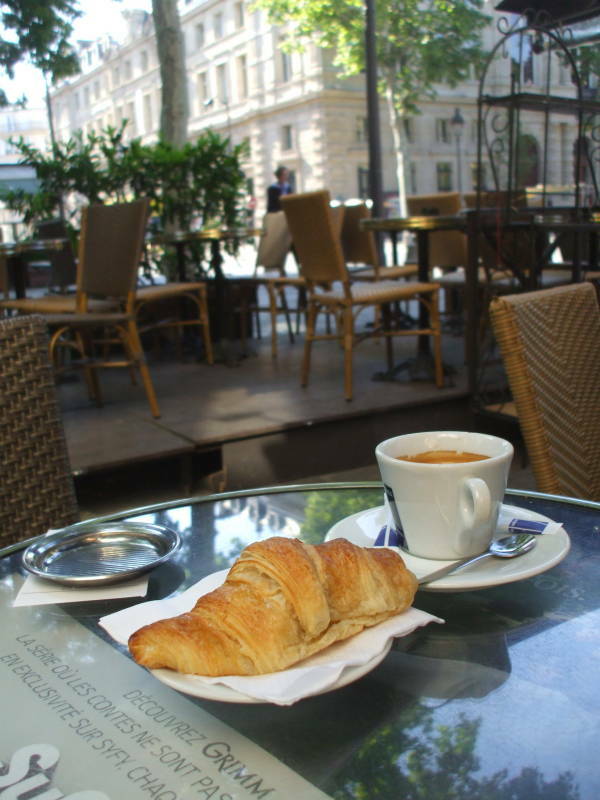 In the morning you can have coffee and a croissant and watch the neighborhood get started for the day. 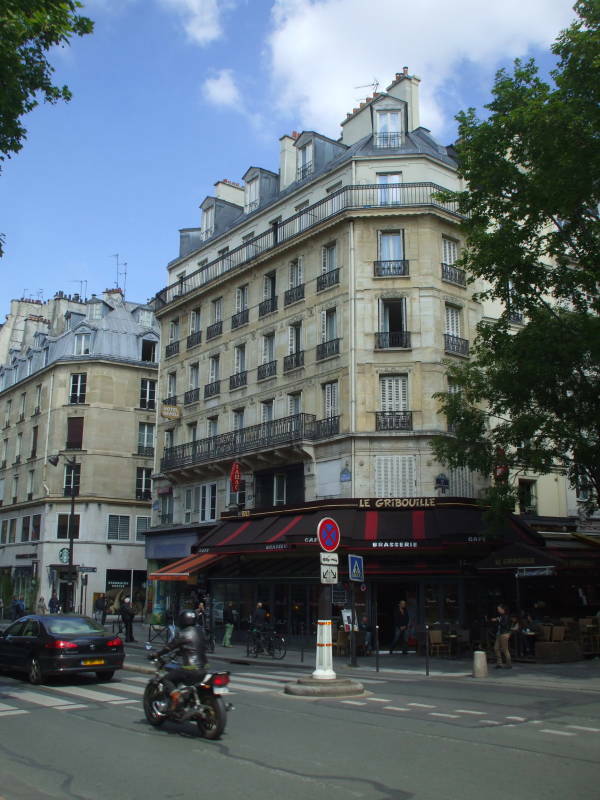 A little further east on rue de Rivoli, the name changes to rue Saint Antoine. 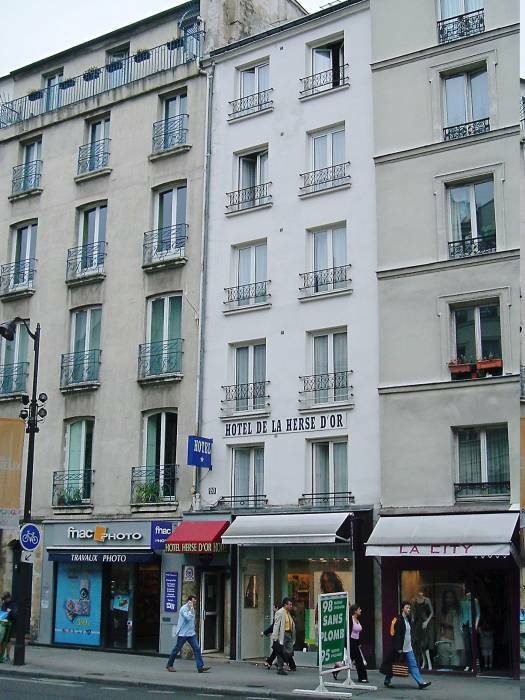 Hôtel de la Herse d'Or is just a little further past that transition, at 20 rue Saint Antoine. Their phone number is +33-(0)1-48-87-84-09. It's a narrow place, just two windows wide. You enter through a door nexts to a shop, going back a narrow hallway to the office. Then the rooms are all upstairs. I just stayed there for a few nights in 2005. 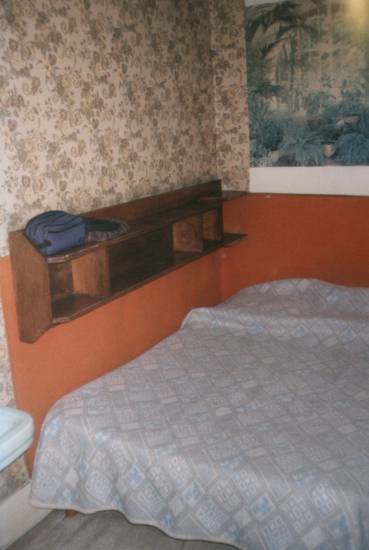 It was 32€ for a simple room with a bed, cabinet, desk, TV, and sink. There was a small window, it opened into a narrow window well. The toilet was down the hall, the douche or shower was on the floor above. It's similiar to Hôtel de la Herse d'Or. These are close friends of my parents, they stayed at the Sully for a night during a canal boat trip. It was 46€ for a simple room with lavabo only. One time I needed to stay near Gare Saint-Lazare. 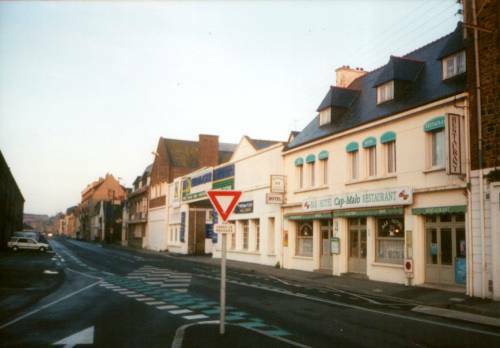 I found the Hôtel de Dieppe in an on-line search. It was significantly most expensive than the Rivoli, Herse d'Or, or Sully, about 70€. But was still just about a third the cost of other hotels in that area. 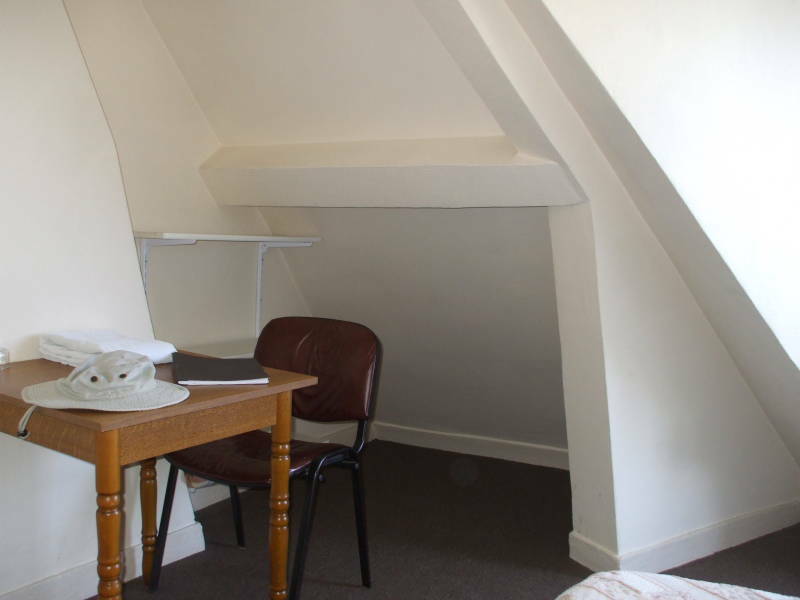 Fully en-suite, with a double bed that's two single beds pushed together, a TV, and more. 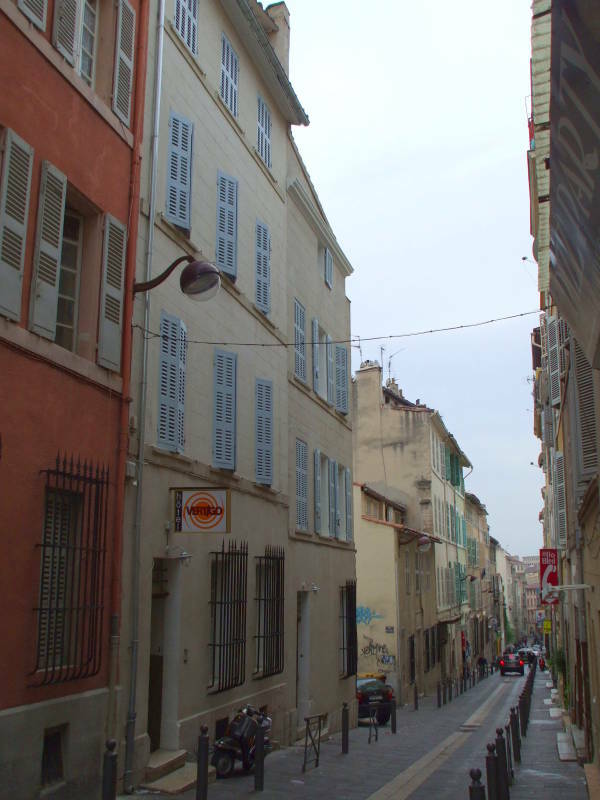 Charles Baudelaire (1821-1867), the author of Les Fleurs du Mal and notorious member of the Club des Hashischins, lived here for several years. 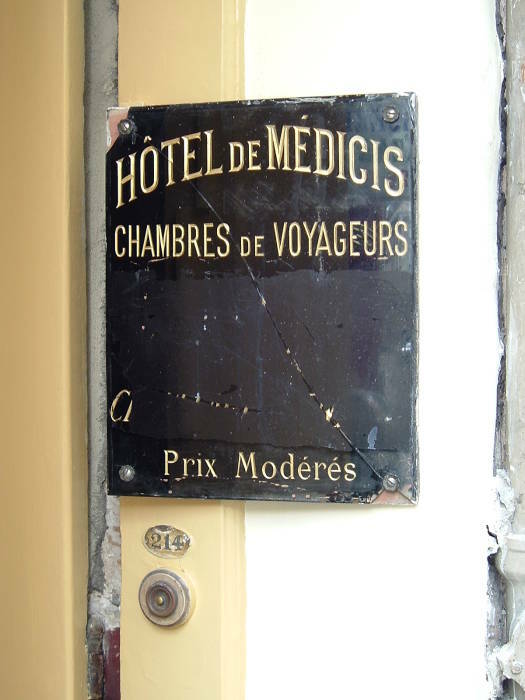 Hôtel des Médicis was at 214 rue Saint-Jacques. I stayed there in 2001. By 2009 the building had been gutted, and a new luxury hotel constructed behind the old façade. They didn't take reservations, you had to just show up and take your chances. I got lucky in late October and got a room there. This is where Jim Morrison lived for a while. I have a detailed page with more pictures of the exterior and interior. The office was a couple of flights of narrow stairs up from the street. 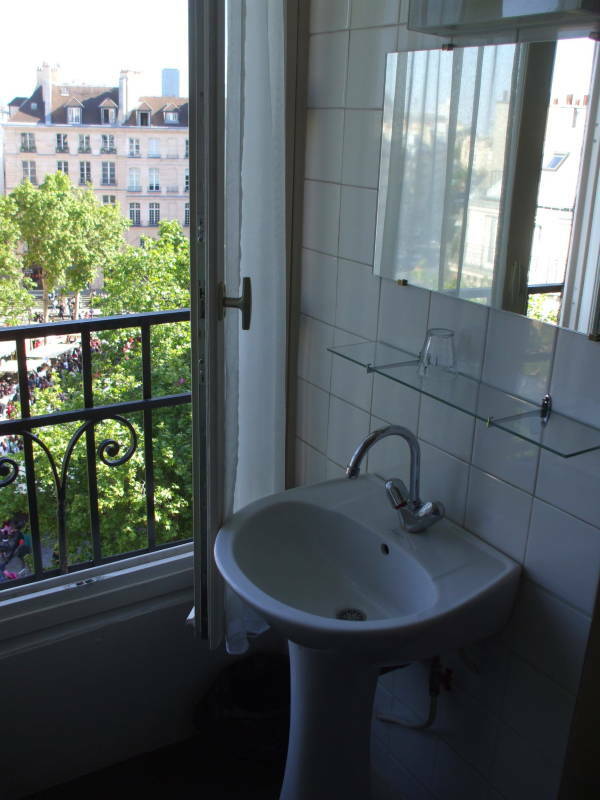 Each room had a sink and a bidet. The rooms on the back of the building looked out into a large courtyard. You got a large bed, a table and chair, a non-functional fireplace, and the lavabo and bidet. 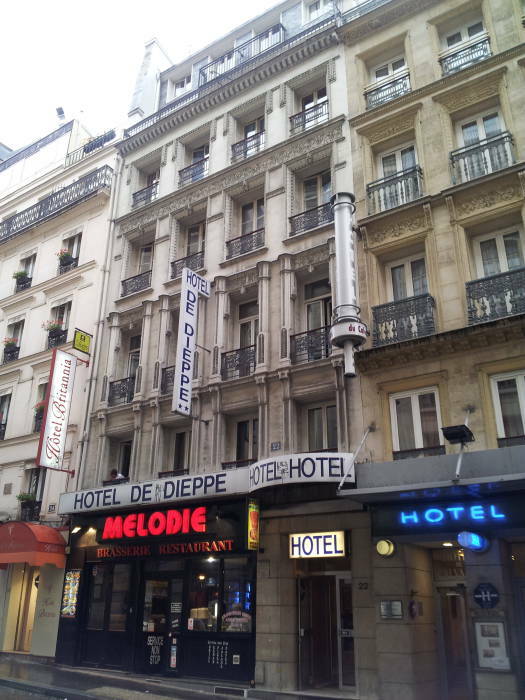 There are some business-oriented hotel chains in France. 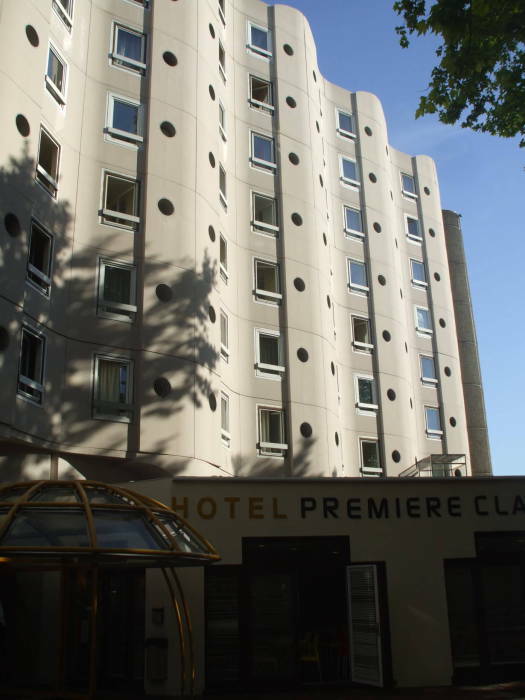 The Hôtel Première Class is one of these. I've noticed that French and U.S. hotel categories are kind of the reverse of each other. I think this is because of very different emphasis on work versus leisure. The French work to live, while Americans live to work. In the U.S., a business-oriented hotel is the fancy one, charging multiple times the nightly rate of a tourist hotel. There is an elaborate breakfast buffet, and possibly a "reception" that's basically a light dinner, possibly with wine and beer, Monday through Thursday nights. The bed and bath linens are luxurious, and coffee and several varieties of tea can be prepared in the room, which may really be a nice apartment with bedroom and a living room with kitchen area. I've heard someone dismiss a hotel in Manhattan as, "Well, I suppose it's a perfectly adequate tourist hotel." In New York, this is the sort of place that is cheaper than you would expect for a Midtown location, and the furniture and furnishings are the sort you would find along an Interstate highway in the midwest. You can tie your shoes in the room, as long as you are sitting in the one place where it's possible to bend over to do so without running your head into the wall or into the small cabinet made of particle-board and chipped laminate. 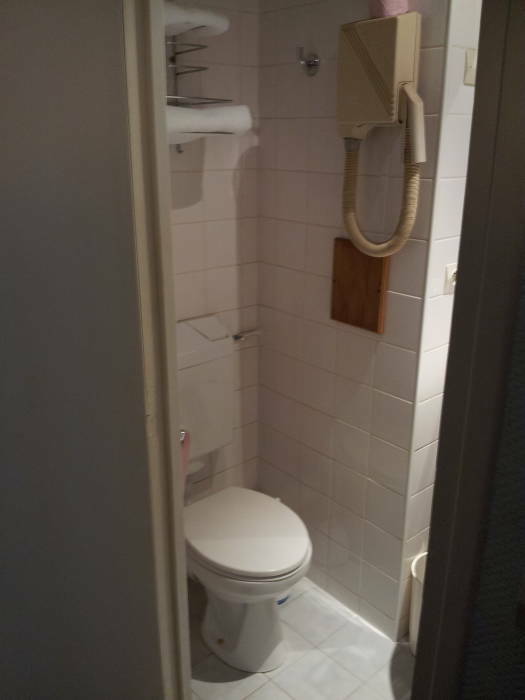 In France, it's the business hotel that's the just barely adequate place. There's a bed you can sleep in, and a toilet, sink, and shower. On a related theme, the BBC reported in 2016 on a plan by the French government to require companies with more than 50 employees to draw up a "charter of good conduct" setting aside the hours in the evenings and over the weekend when staff are not supposed to send or read work-related emails. The plan's supporters refer not only to the ever-increasing stress caused by work responsibility taking over more and more time, but also to how creativity suffers when employees are never off work. This business hotel is in Cergy-Pontoise, a somewhat bleak outer suburb of Paris where various national government agencies are based. 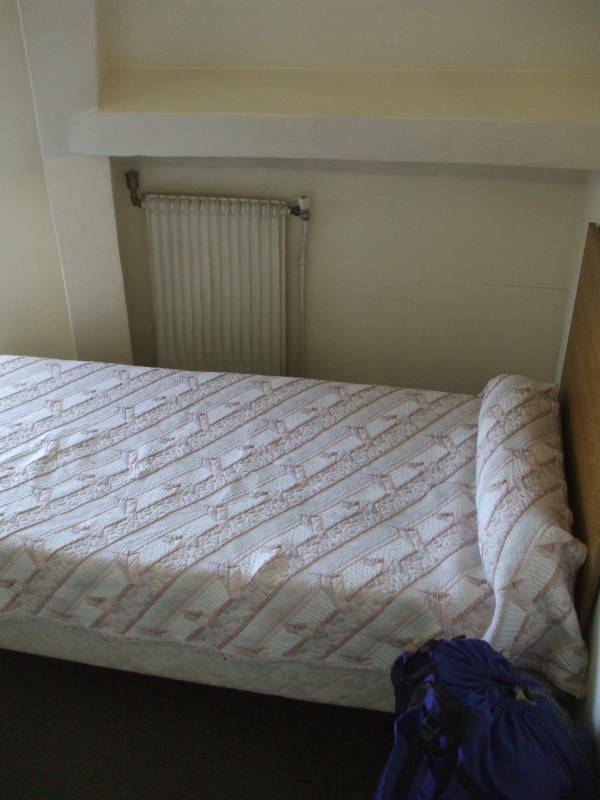 Our rooms, perfectly functional, were just 38€. The staff was mostly from former overseas possessions, speaking French with thick African accents. The French you study in school is the version spoken in the Loire river valley, pure French as recognized by the Académie Française. The better someone's French is, the easier it is to understand. The French spoken by people recently arrived from equatorial former French territories, not so much. 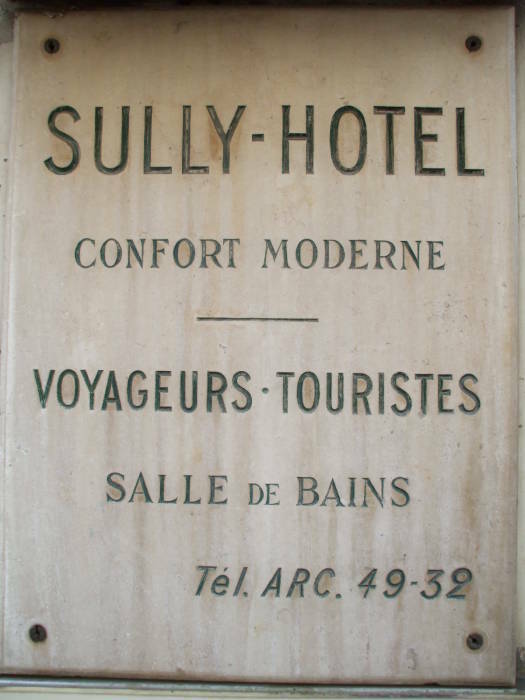 The hotel was a modern building, but it had an atmosphere out of a story by W.S. Maugham, Graham Greene, or Eric Ambler. I liked it. 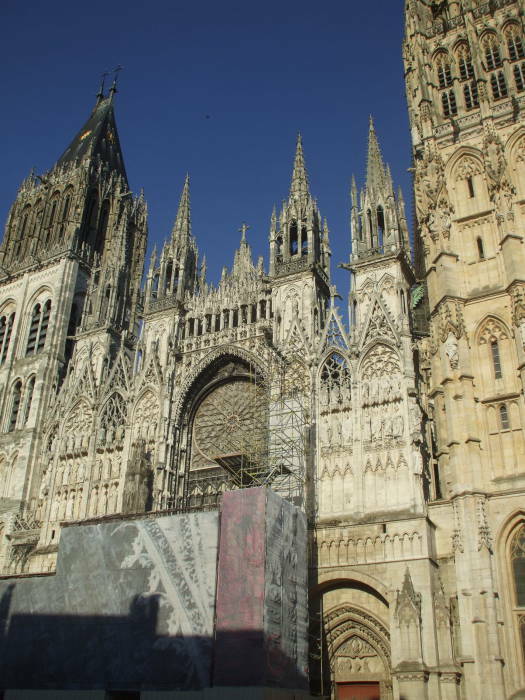 The Hôtel le Palais is near the center of Rouen, between the large old cathedral that Claude Monet painted so many times and the very modern cathedral dedicated to Jean of Arc. 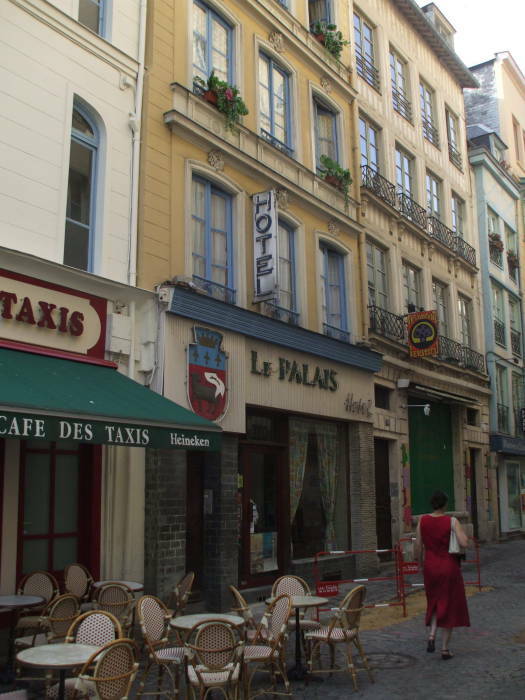 It's at 12 rue du Tambour, just off the main pedestrian passageway. I made the reservation over the phone, +33-(0)2-3571-4140. At least at the time, they didn't have a web site and didn't use email. 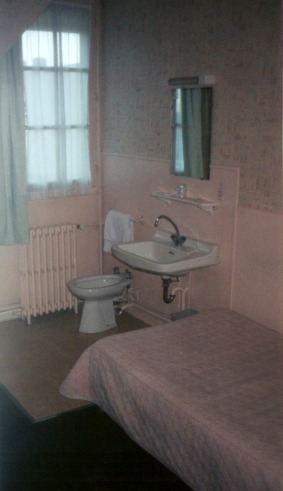 Some of the rooms are en suite, some have just a sink. 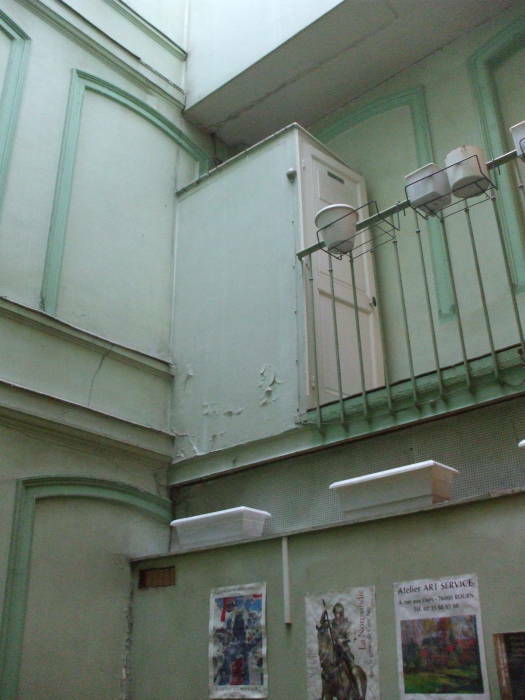 One of the toilettes au couloir is in a small cabin on a balcony in the central light well of the building. 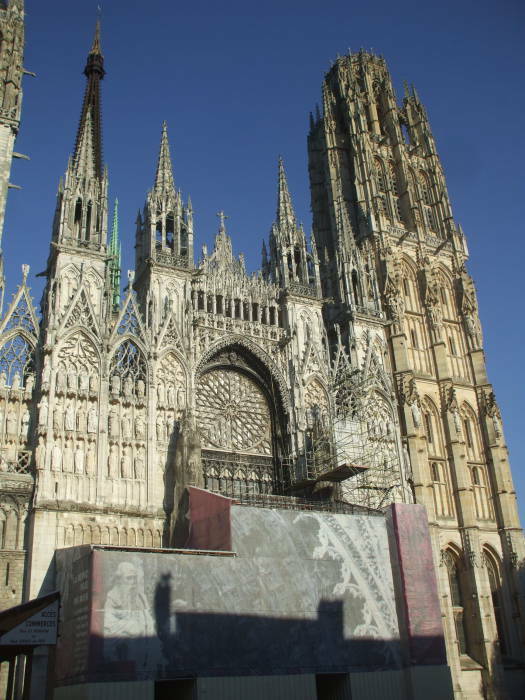 The Cathedral de Nôtre-Dame painted so many times in varying light by Claude Monet is a short walk away. Above are photos of Cathedral de Nôtre-Dame in Rouen, in the late afternoon. 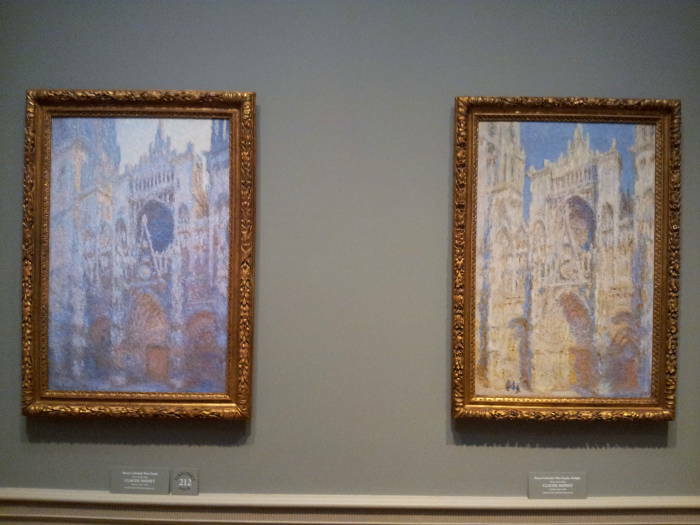 Below are two examples of Monet's paintings from the National Gallery of Art in Washington, D.C. The one at left depicts it in the morning, when the façade is in shadow. The other shows it in the afternoon. Monet got to paint it without repair scaffolding in the way. 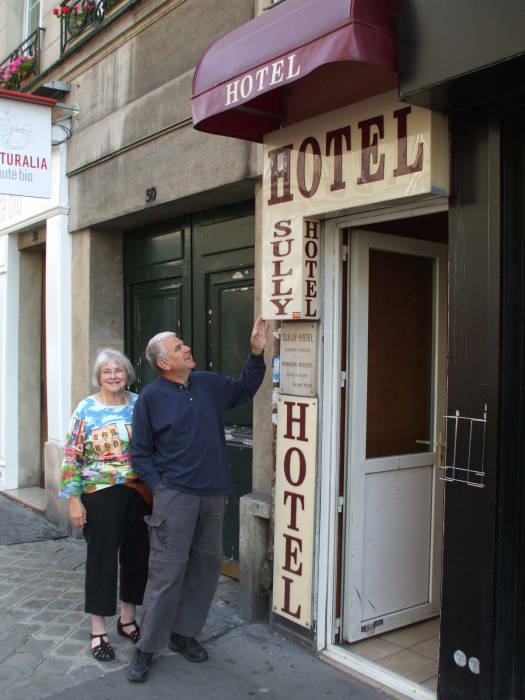 I stayed at the Hôtel Jehan de Beauce which is just across from the train station at Chartres. 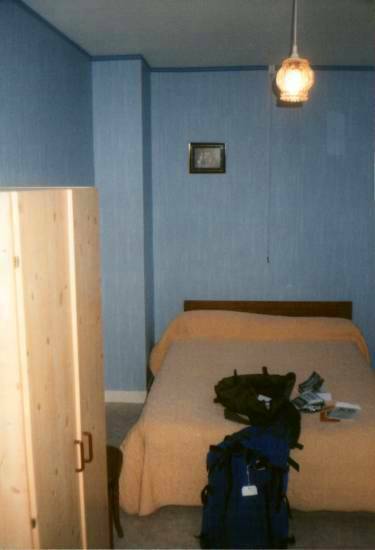 This was in the pre-Euro days, the room was 160 FF then which would be about 18€ now. 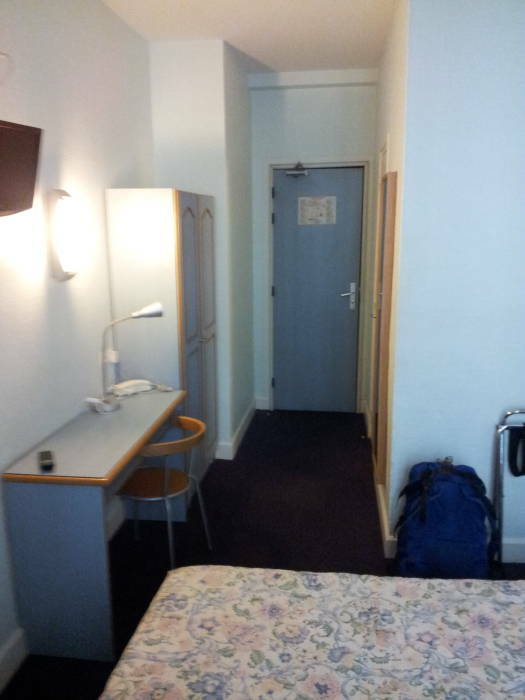 The budget hotels are usually right around the train station in smaller cities and towns. My room was basic but nice. 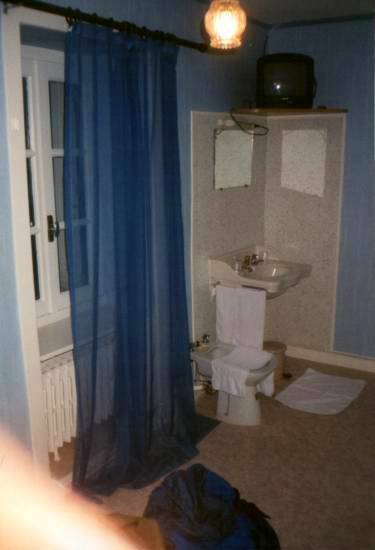 It had a bidet and sink, the toilet and shower were down the hall. The tops of the towers of the cathedral were visible from my room, as you can gauzily see through the curtains. I had two one-week teaching jobs, the first in London and the second in Frankfurt, with two weeks in between. I told the training company that they would only have to buy one trans-Atlantic round trip ticket, I would be sending them receipts for some train tickets, a ferry ticket, and some cheap hotel rooms. I crossed from Portsmouth to Saint-Malo on an overnight ferry. I walked around the inner harbor and got to the Cap-Malo Hôtel-Restaurant just as they opened to serve breakfast. It was late October, the low season, they gave me a room for just 180 FF a night, now equivalent to 20€. I paid in advance and got my own key, so I could let myself in after the bar had closed in the evening. On that same trip, I went from Saint-Malo to Pontorson, which is walking distance to Mont-Saint-Michel. The Clarisse Bar-Hôtel-Restaurant was just across from the train station. A nice room was about 180 FF a night, now equivalent to 20€. 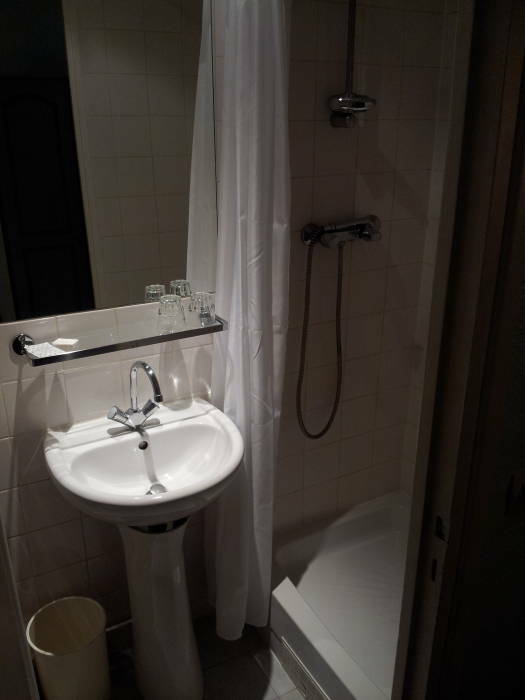 That got me a room with a TV, sink, and bidet. Like the Cap-Malo and Saint-Malo, the Clarisse is upstairs from where the locals get breakfast, have dinner, and hang out at the bar in the evening. 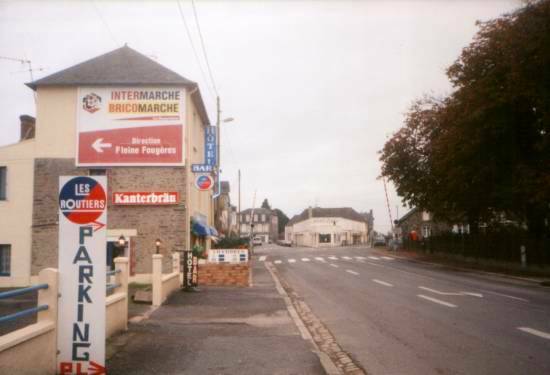 Briare is at one end of the Canal Latéral à la Loire, which runs south through Decize and eventually connects to the Rhone River, leading on to the Mediterranean. 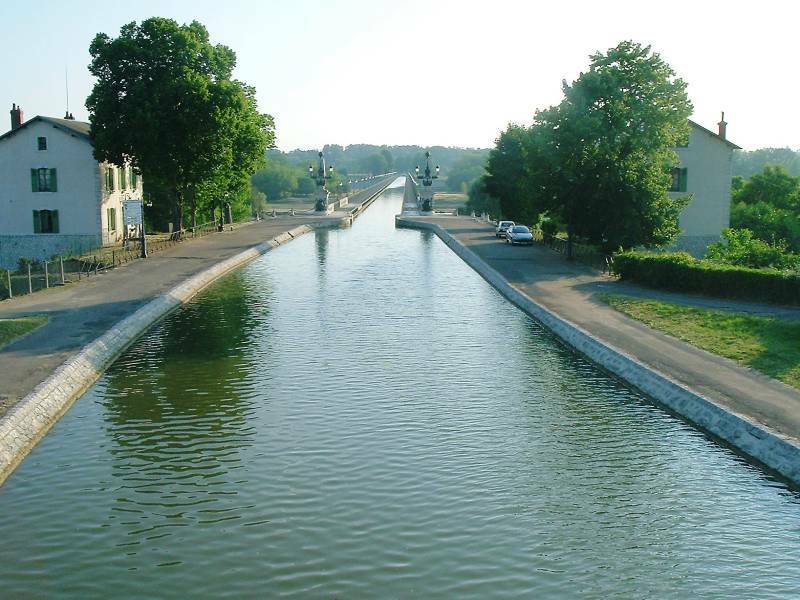 A second canal, the Canal de Briare, connects in Briare and leads north to the Seine River, and through that to the North Sea and Atlantic Ocean. The Pont-Canal Briare or the Briare Canal Bridge carries the canal over the Loire River. It opened in 1896, and was the longest navigable aquaduct in the world until a longer one opened across the Elbe in Germany in 2003. 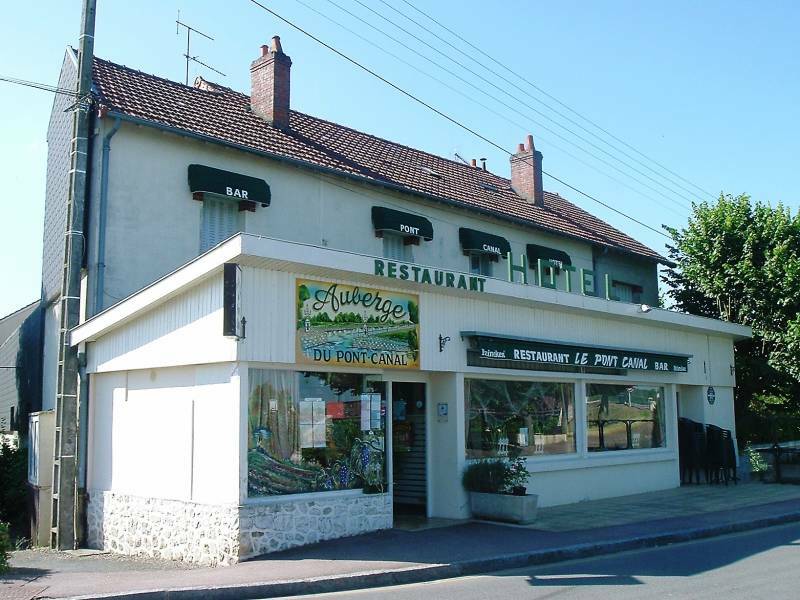 The Auberge du Pont Canal is right on the canal, at the Briare end of the canal bridge. It's at 19 rue du Pont Canal, 45250 Briare, telephone +33-(0)2-3831-2424. Its double rooms, all fully en-suite, were 46€. 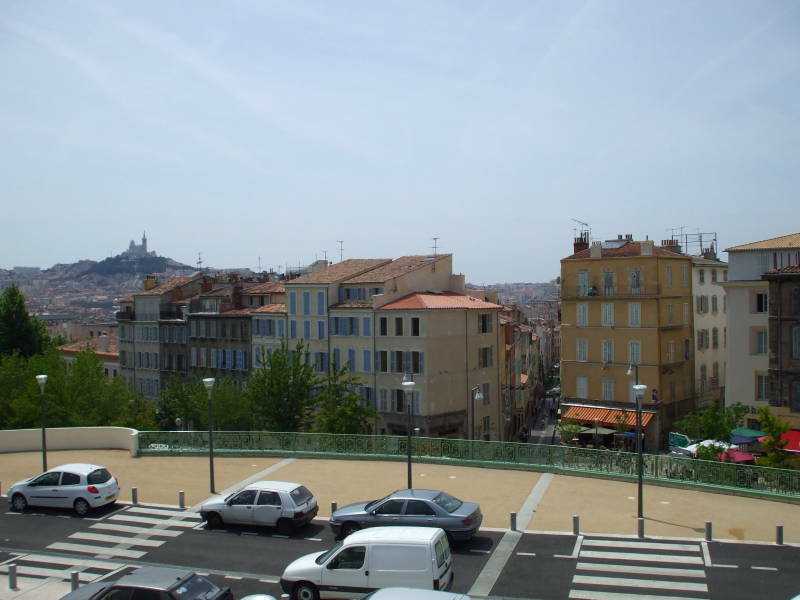 When you arrive at Gare de Marseille Saint-Charles and exit the station, you are looking out over the city. 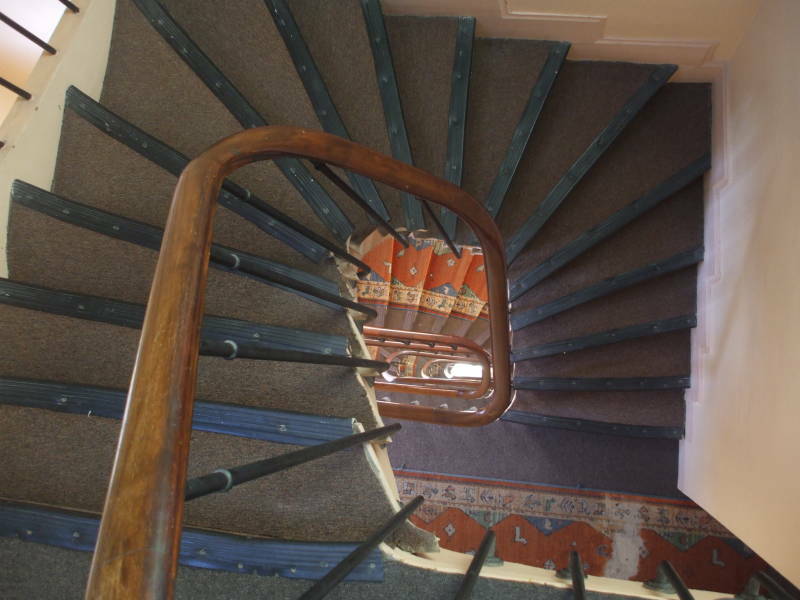 A large dramatic staircase leads down to your left toward the Canabieres district. The basilica of Nôtre-Dame-de-la-Garde is visible in the distance. 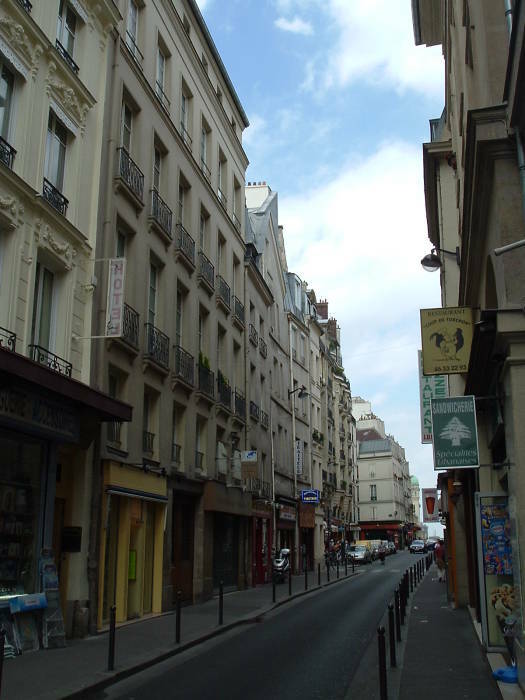 Immediately across the street, the narrow rue des Petites Maries leads down through some side streets. 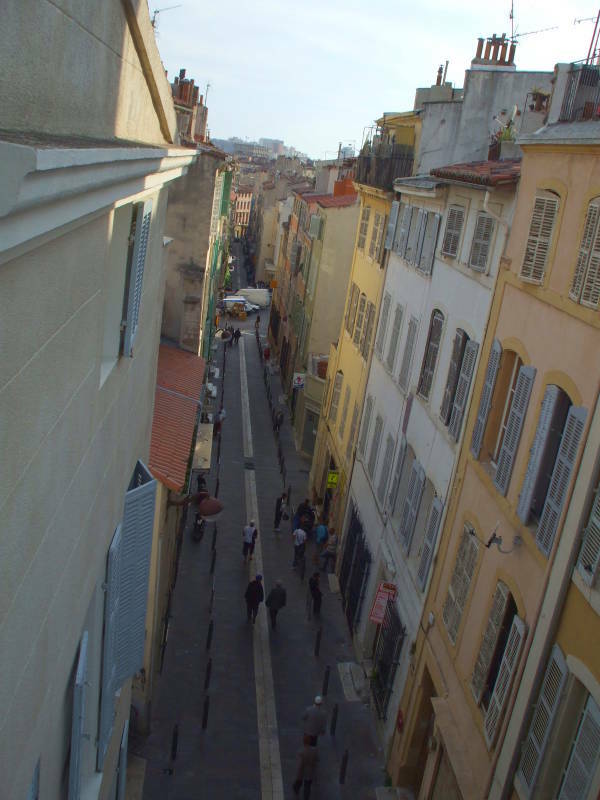 The Vertigo Hostel is just a few doors down that narrow street. It has some shared rooms, maybe four beds each. And it has some traditional en suite hotel rooms. The last time I stayed there it was 23.50€ for a bed in a shared room, or 55€ for an en suite double room. From the upstairs rooms on the front side of the building you can look up at the station, and on down rue des Petites Maries. The top several blocks of that narrow street have a number of small hotels and several shops selling SIM cards for mobile phones and offering booths from which you can make calls on their phones. Béziers is in Longuedoc, on the Canal du Midi which joins the Mediterranean to the Atlantic through Toulouse. 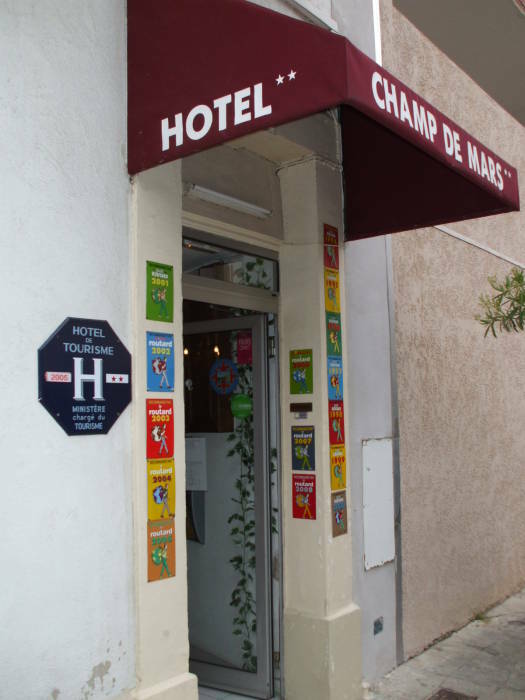 The Hôtel Champ de Mars is a nice place to stay in Béziers. 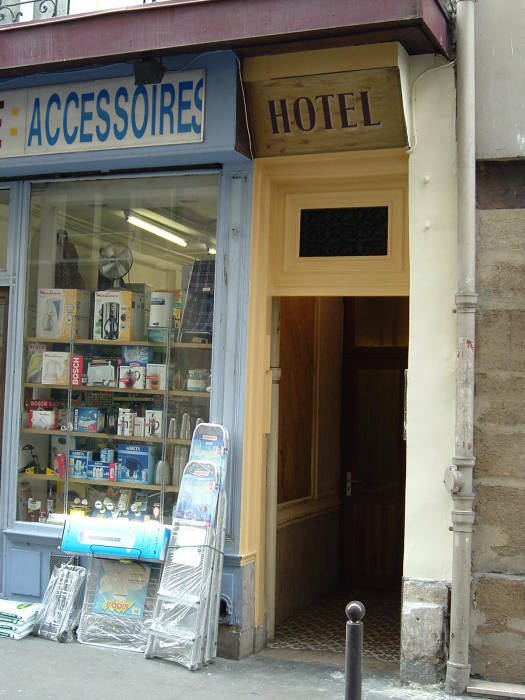 It's at 17 rue de Metz, +33-(0)467-28-35-53. 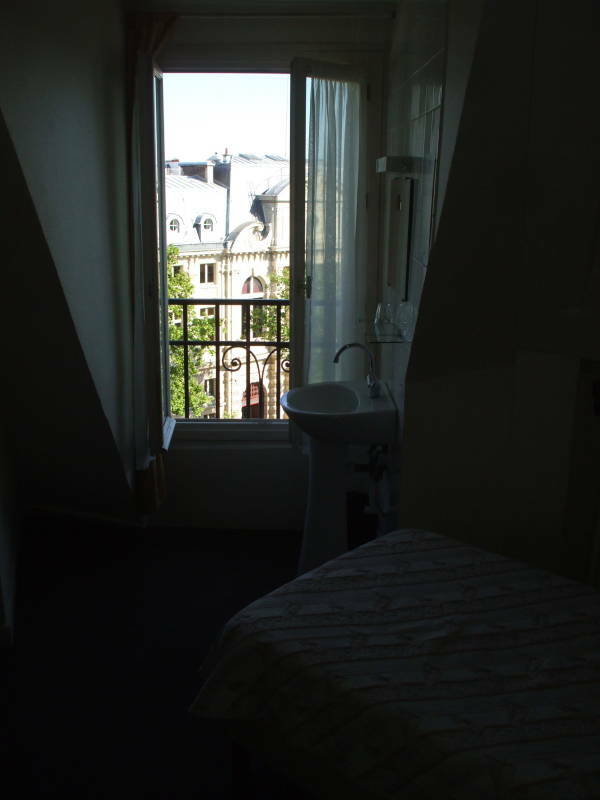 A single room was 37€, doubles were 43€ and 48€, all of them en suite. The entryway, like those of several of the hotels on this page, is lined with placards from the Guide du Routard guidebook. The star system for hotels in France is based on a standard formula. This isn't a subjective ranking from a guidebook or magazine or the result of guest surveys, it's quantitative analysis by a government agency. Room size, lobby size, whether there's a TV in the lobby, whether the rooms at least 9 square meters in size (needed for the 2nd star), and several more criteria. Many of the checklist items wouldn't be obvious or make much of a difference to a typical guest. 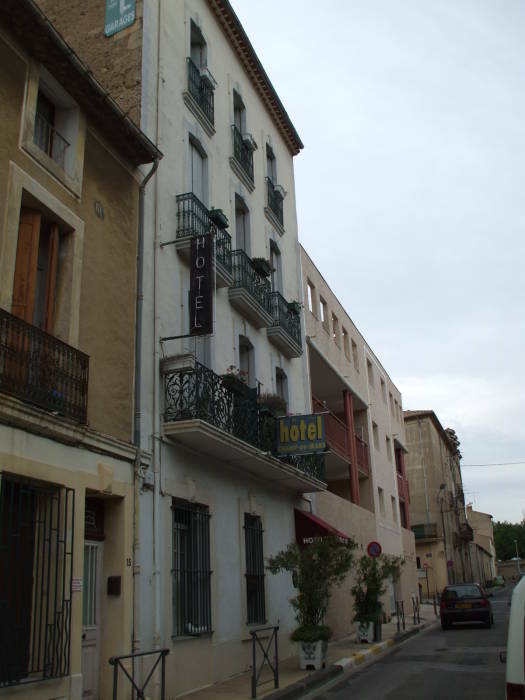 The Hôtel Splendid is at 17 rue Agricol Perdiguier, +33-(0)490-86-14-46, www.avignon-splendid-hotel.com. There are two train stations at Avignon. The TGV station is outside the city, a bus runs back and forth between it and the old station near the center where the non-TGV trains (and a few of the TGV ones) stop. The station is near the center but not at it, as Avignon is an old walled city. The central train station is just across from one of the gateways through the city walls into the old city. You walk out of the central train station, cross the street and pass the bus stop for the connection from the TGV station, and walk through the large gate. Walk about a block toward the center, then turn right on rue Agricol Perdiguier, and the Hôtel Splendid is just two blocks down. 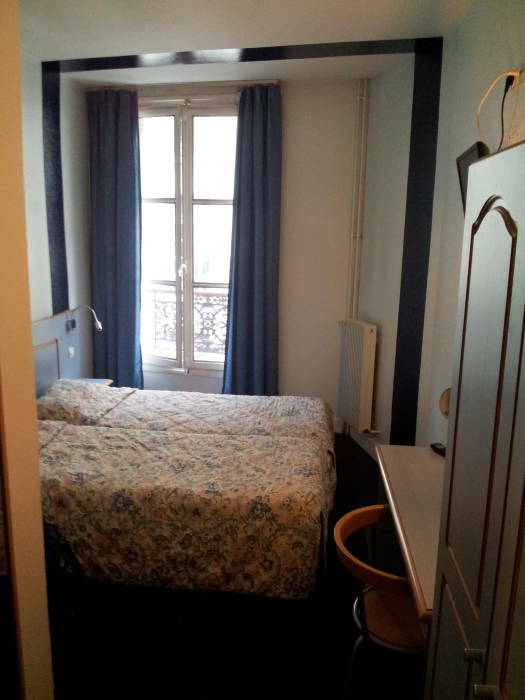 Rooms, all of them en suite, are 45-60€. 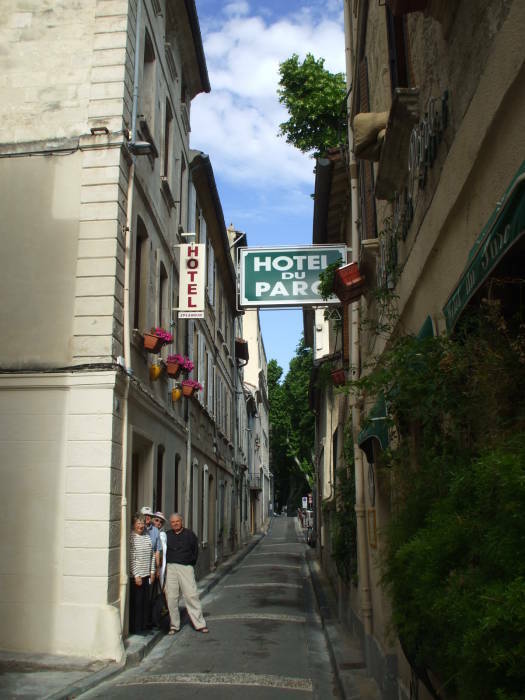 The Hotel du Parc is just across the narrow street, it looks like a similar establishment. A coin operated lavomat is another block or two down the narrow street.